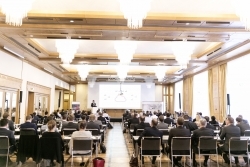 Potsdam, Germany, December 07, 2018 --(PR.com)-- Over 100 international costing experts met on November 29 at the 11th FACTON User Conference in Stuttgart, Germany. “Predictive Costing” was the theme of the event, where guests discussed the latest topics: From artificial intelligence and related application possibilities in product costing, to smart factories and costing electronic components, all the way to advances in the FACTON EPC Suite and insights into best practices developed by FACTON customers. FACTON Product Management presentations centered on specific application possibilities. The team not only introduced the FACTON EPC roadmap, it also illustrated the flexible application possibilities afforded by the FACTON EPC platform and FACTON’s innovations in real-time simulations of profitability calculations, project costing and easy ways to create a wide range of cost models using the FACTON Cost Model Designer. Electronic component costing was another subject that required its own session. After all: There is virtually no other sector with shorter development cycles and more complex products than the electronics industry. Moreover, the share of electronics is growing in every industry sector. This is why it is important to build the requisite expertise early on to ensure costs remain under control. To help keep track of electronics costs, a costing software package must offer a breadth of features such as the ability to easily identify, manipulate and edit electronic components or access current machine data on electronics manufacturing along with new processes and test procedures. The IT consulting firm MHP Management- und IT-Beratung GmbH expanded on the topic of increasingly complex production chains with the level of individualization. The problem: The industry has optimized its production systems for series and mass production over the past few decades, but the trend is still moving towards increasingly individualized and flexible small series production. Using a smart factory as a service enables growth-oriented companies to focus on their own core competencies, develop customer-centric products and outsource production as a service to a specialist in this area. This year’s practice-oriented presentation was delivered by Giesecke+Devrient, a globally operating company specializing in physical and digital security technologies. FACTON EPC has been used for four years in Should Costing as early as the development phase in the sector “Currency Technology” – which, among other things, develops machines that produce uncounterfeitable banknotes. Due to the high level of variability and low quantities, product costing was a confusing and complex task before the software was implemented. Now FACTON EPC makes it possible to identify savings potential early on thanks to standardization, knowledge retention and a valid body of data. Costing expenditure was cut and product costs were slashed. After participants had spent the day discovering what the future will bring, Professor Dr.-Ing. habil. Horst Zuse, the son of Konrad Zuse (1910-1995), the inventor of the first freely programmable computer to use Boolean logic and binary floating-point numbers, concluded the event with an enthralling history lecture. Konrad Zuse completed the Z3 in May 1941 in his small workshop in Berlin-Kreuzberg. Horst Zuse’s presentation clearly illustrated his father’s contribution to the development of computers. For example, not many people know that Konrad Zuse founded a computer company in 1949 that manufactured more than 800 units. It was the first business to commercially produce computers. Horst Zuse also acknowledged other scientists and institutions that were involved in creating the digital computer and are currently developing new models.